This is pretty cool, since if I know that Botgirl posts a lot about virtual identity I might want to see her whole portfolio here. Or even if you’ve never seen this blog before and don’t know any of the authors, you might find Yordie’s enthusiasm infectious and want to see what else she’s written. Think of your CATEGORY as the one (or two) primary, overarching topics of your post, and tags as anything you discuss along the way. We don’t want to “stuff” the categories, because when you call for the “Archive” on Augmented Reality or Blue Mars, we’d like to see posts that are really about that. If you did a feature comparison of Blue Mars vs Cloud Party the it’d be appropriate to use both Categories. Tags are important both because they’re another way to search on the smaller details of posts, and also because they help search engines find our posts. But “Tag Stuffing” doesn’t really help. So if Rafaella’s post on that Hayward Gallery show says some things about Yves Klein, then he should be a tag. But if I’m writing about something and I quote Andrew Jackson on “the price of liberty” I really shouldn’t put Jackson as a tag, because people searching for him probably don’t want my post about something else. He’d only be a tag if I do some discussion about him or his ideas, not simply to invoke his quotation. So having some tags will really help your work get seen. But they say too many tags will actually put you down in search results. So again, Yves Klein yes, Andrew Jackson no. 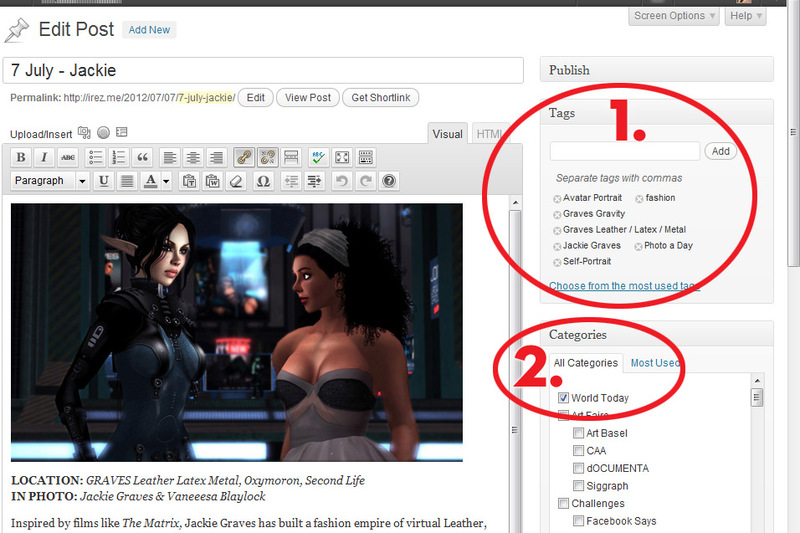 WordPress used to say that your Categories + Tags should total to about 5 to 10. Recently I’ve seen them say 15. haha, Tag Inflation! Anyway, I try to use 1 or 2 Categories and 5 or 6 tags. As always, if I made it more complicated instead of clearer, or made your brain hurt in any way, PLEASE just ignore me! Being a little more efficient with things can be a plus, but let’s keep it as fun and easy as we can.